One person of principle can always make a difference. It is with great pride and gratitude that we announce Rist Bonnefond, Headmaster Emeritus and visionary educator, as Commencement Speaker for the 194th Commencement Ceremony on Saturday, May 26. 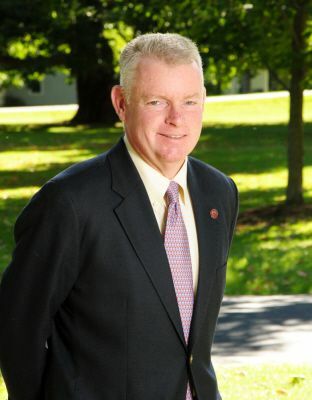 Throughout his 21 years of service to Kents Hill School as Headmaster (1990-2011), Rist demonstrated the power that boarding and independent schools have on the lives of young people. His legacy is underscored by the capacity to not only develop and champion - but live - the institution's core values in every aspect of his life. In a 2011 address to the school community, Rist noted, "If we think about the question, "What is Kents Hill like? ", we eventually come to realize that the answer lies, not so much in the physical features of the place, but in its spirit, its values, what it enables us to learn about ourselves and others, and the skills it gives us to become learners throughout our lives ... Whenever I talk to members of the extended Kents Hill family - students, teachers, staff, alumni, parents, and trustees - whatever their age or connection to Kents Hill - it is the Schools's values and opportunities for personal and intellectual growth that loom largest in their recollection of Kents Hill and its impact upon their lives." "I am both honored and humbled that Rist will be our Commencement Speaker this year," said Head of School Christopher S. Cheney. "From my first interview, I heard about this legendary Headmaster who served the school from 1990-2011. Most striking was his foresight and ability to cultivate an intentional, purposeful, and thoughtful community where students are inspired to reach their fullest potential and are surrounded by adults who are encouraging and supportive. Kents Hill was and continues to be a place where the individual has always and will always matter. Lest we forget: One person of principle can always make a difference. Rist and his wife Joy are, without exception, two of these people. I aspire to serve the Kents Hill School community as well as he did." Please click here to learn more about the Commencement Ceremony. Located in central Maine, Kents Hill School is an independent, coeducational boarding and day school grades 9-PG attracting 225 students from 17 states and 18 countries. Since 1824, Kents Hill has been dedicated to providing transformative experiences rooted in the power of community, character, and core values. Students are coached through a 4-dimensional (4D) experience of leadership development, academics, athletics, arts, and extracurricular activities.